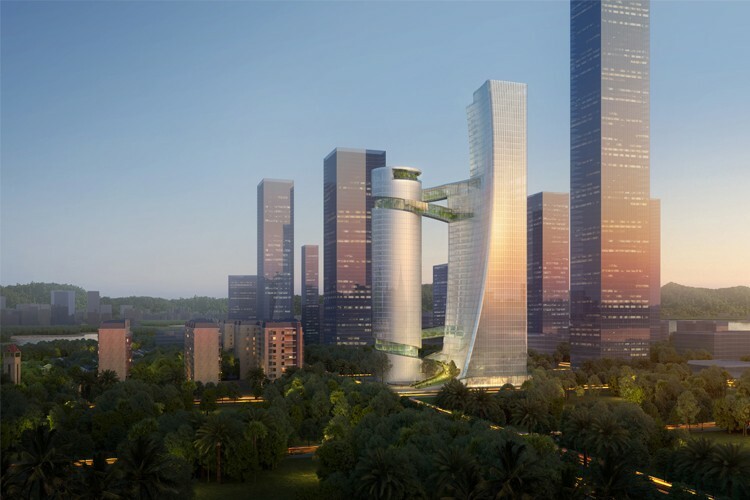 SHA has won the competition for the headquarters of genome machine intelligence company iCarbonX in Shenzhen. The form of the two towers is inspired by a study of genes and DNA. The first tower, 'Body A' is residential, while the second, 'Body B' is the working program, with offices, labs, and public reception spaces. Four green bridges, inspired by carbon bonds, connect the towers. The two upper bridges connect a health and nutrition circuit with cafes, a gym, and a swimming pool. The two lower bridges connect to form public outreach spaces, a clinic, galleries, and meeting spaces. The iCarbonX Clinic is the central element that anchors the Living and Working towers, making physical ICX’s mission to apply science to daily life. The bridges are filled with native topical plants selected to create a diversity of experiences. Curvilinear geometry shapes the ground-level public space with water gardens and a central recycled-water “Pool of Knowledge”. The podium-level garden is partially embedded in the ground, creating a peaceful, protected space. The pool’s continuously circulating water masks the sounds of the city, creating a sense of calm. iCarbonX is in design and foundation construction is set for Fall 2019.